We offer engraved and full-color name badges in many sizes. The name badges are available with magnetic, bull dog clip, or traditional pin fasteners. Our 60 mil plastic name badges provide a modern style and allow you to include a crisp, full-color logo. Below are some samples of our full color name badges. With our engraved name badges, you can represent your business with a classic and elegant style. Below are some samples of our engraved name badges. Currently our most popular fastener is the magnetic clip. This clip allows you to wear the name badge without creating a hole or a crease in your clothing. 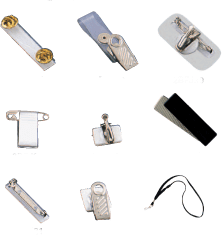 We offer the following fastener options for the back of your name badge.